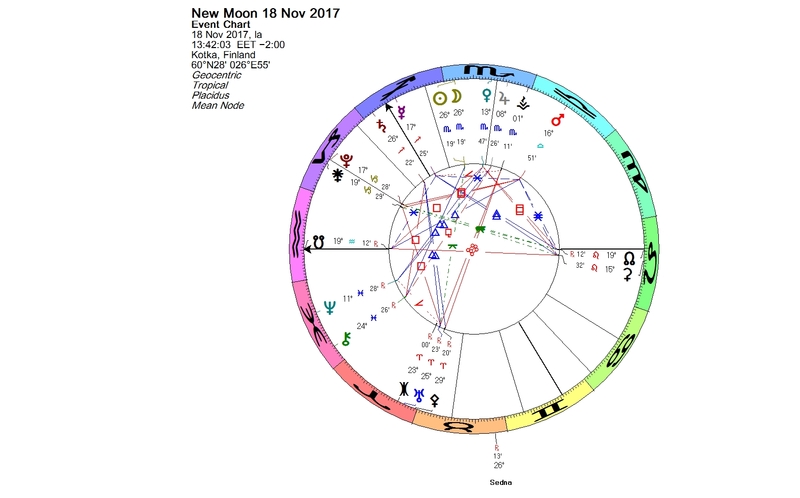 The New Moon at 26+ degrees of Scorpio on Nov. 18, 2017, was opposite Sedna at 26+ degrees of Taurus. Currently Sedna is also receiving the following aspects: a quincunx (150 degrees) from Saturn at 26+ Sagittarius, a sextile (60 degrees) from Chiron at 24+ Pisces and a semi-sextile (30 degrees) from Uranus at 25+ Aries. Sedna has an exceptionally long and elongated orbit. The orbital period is around 11,400 years. At the moment Sedna is about three times as far as Neptune, approaching the Sun, and coming to its perihelion in 2076. Sedna is named in honor of the Inuit goddess of sea and marine animals. She is thought to live at the bottom of the frigid Arctic Ocean. There are several variants of the myth, but all of them agree that Sedna was a beautiful young girl, who became the goddess of the icy waters. According to Grey Eagle, a Native American ceremonial storyteller, “all the broken taboos and sins against the nature of the people fall through the water, to collect on Sedna’s body. When the accumulation is too great, Sedna sobs in pain.” The sea creatures gather by her door to comfort her, and in the above world there is hunger and sickness. Then a shaman must visit her in the deep waters and clean her body and comb her hair. When Sedna is happy again, she releases her mammals and allows the humans to eat from the bounty of the sea. Astrologically Sedna has a strong association with climate change and other environmental issues. She reminds us that we should not be exploiting the resources of Earth. Sedna must be treated with respect. The Arctic region is a unique area among Earth’s ecosystems. So far it has remained comparatively clean. The Arctic holds 1/5 of Earth’s water supply. Endangering this pristine area is inexcusable. Arctic oil drilling is dangerous, because in freezing conditions oil is known to behave very differently than in lower latitudes. An oil spill would have a catastrophic impact. There is no way to clean up oil underneath the thick ice. Environmental organizations have filed a historical lawsuit against Norway. On April 22, 2016, Norway signed the Paris Agreement’s goal of limiting global temperature rise to 1.5 Cº. The subject of the lawsuit is the government’s decision to grant new oil drilling licenses in highly sensitive areas of the Norwegian Arctic. The first hearing will take place on Nov. 21, 2017, at Oslo District Court. In one of the variants of the Sedna myth she is described as a hungry and greedy girl. She was so huge and hungry that she ate everything in her parents’ home, and even gnawed off one of her father’s arms as he slept. Humankind cannot afford to be greedy anymore. We have to face the facts and work together in order to save our planet. This entry was posted on Sunday, November 19th, 2017 at 10:05 pm	and is filed under New Moon. You can follow any responses to this entry through the RSS 2.0 feed. You can leave a response, or trackback from your own site.